Audi's RS line-up has made a comeback to the North American market as experienced race driver, Don Istook took delivery of the first 2012 TT-RS Coupé. Istook was one of the first people in the U.S to race in a Audi Quattro vehicle. Istook said in a statement; "I like my street car to give me some of that thrill. With my new Audi TT-RS, I not only get that thrill but I also get that 'race car' sound." The TT-RS Coupé starts at $56,850 and is powered by a turbocharged 2.5 litre, 5-cylinder petrol engine that pumps out 355bhp (360PS/265kW) and 465Nm (343lb-ft) of torque. This is married exclusively to a slick-shifting 6-speed manual gearbox. The return of the heralded Audi RS line to the American performance car scene officially launched when Forth Worth Audi in Texas delivered the first 2012 Audi TT RS in the U.S. to veteran race car driver Don Istook. Last year, Istook was one of more than 11,500 fans to sign the Audi TT RS Facebook petition drive, which helped convince Audi to introduce the 360-hp coupe in the U.S. But Istook's connection to Audi and to the TT performance car line runs far deeper. The Fort Worth native was one of the first drivers to race an Audi Quattro in the U.S. in 1985 and he drove Audi S4 models in the Motorola Cup, which became the Grand-Am Cup. More recently he has raced Audi TT quattro coupes. "Having raced at almost every major track in the U.S. and Canada, I've pushed the limits in many cars in my 34 years as a race car driver," Istook said. "I like my street car to give me some of that thrill. With my new Audi TT RS, I not only get that thrill, but I also get that 'race car' sound." The 2012 Audi TT RS stands as the pinnacle of the TT model line, representative of the highest performance category for Audi vehicles. The Audi TT RS, powered by the award-winning 2.5-liter turbocharged five-cylinder TFSI engine, generates 360 hp between 5,500 and 6,700 rpm, and 343 lb-ft of torque between 1,650 and 5,400 rpm for power on demand. With aluminum and steel hybrid ASF® technology and standard quattro® all-wheel drive, the TT RS offers excellent aerodynamics and increased rigidity and safety. The 2012 Audi TT RS is priced at $56,850 (excluding $875 destination charges, taxes, title, options and dealer charges). The newest Audi for the U.S. market truly showcases the performance engineering of the RS line of sports cars produced by quattro GmbH in Neckarsulm, Germany. The RS line has given Audi a special element of sports appeal, individuality and exclusivity. "The technical capabilities of the Audi brand are perfectly distilled in the RS models developed by quattro GmbH," said Johan de Nysschen, President, Audi of America. "For the past few years, American sports car enthusiasts have pleaded with us to make the marquee available here. With the TT RS we are now furthering the Audi performance story that includes models from the Audi S4 to the new Audi R8 GT." Audi has announced plans to follow up with the U.S. introduction of the Audi RS 5 coupe next year. Audi dealers expect keen interest in the RS line. "Interest in the return of the RS marquee has been so strong that Mr. Istook is allowing us to keep his TT RS at the dealership longer to show Audi fans and customers," said Bobby Baillargeon, owner of Forth Worth Audi. The Audi TT RS features exclusive design elements denoting its special place at the top of the TT model line, including high gloss black diamond-patterned Singleframe® grille and large front air inlets, fixed rear wing spoiler, oval exhaust pipes, rear diffuser, unique 19-inch rotor wheels and more. It comes exclusively with a six-speed manual transmission, and available adaptive headlights. The interior also features RS-exclusive appointments, such as the contoured three-spoke sport multifunction steering wheel, aluminum door sills with the RS logo, and RS-specific interior door handles. The Audi TT RS offers electronic features one expects from Audi, including Audi concert radio with single CD player and MP3 reading capability, and a complimentary three-month subscription to SiriusXM® Satellite Radio. Available advanced electronics offer an increased level of sophistication for the premium sports car, including technologies like Audi navigation plus with real time traffic, MMI® inspired controls, a BOSE® sound system, and Audi music interface. 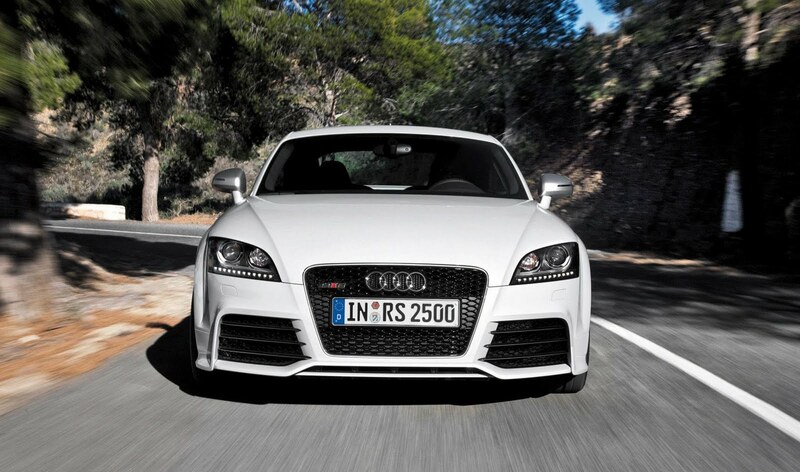 But the specific appeal of the Audi TT RS - and the rest of the Audi RS line - is performance and handling. "Superb brakes and handling go right along with the magnificent power from the 2.5-liter turbo, especially the low end torque," Istook noted. "It reminds me of the mid 80's when we raced the original 5 cylinder turbo Audi Quattro. What is great, though, is that I get all of that, yet I have the refinement, sophistication and technology of a truly modern sports car."